Lenders are queuing up to disburse instant credit - through ATMs, apps and online services. Here's what you can expect. Today, millennials, apps and disruptions have taken over how businesses are run. The loans market, too, is taking a whole new approach. New lending models are catering to the demands of an aspirational India. In fact, products that initially targeted millennials - promising improved customer experience, streamlined processes, competitive rates and instant cash - are now becoming the norm, or even mainstream. Instant credit is as easy as it gets. But as a consumer, you must always be informed. So, here we go. Financial technology, or fintech, companies have come up with mobile applications-based lending platforms that allow salaried professionals to borrow cash anywhere, anytime - within minutes. This model targets young working professionals, helping them meet their lifestyle needs without having to borrow money from friends or relatives. MoneyTap, a Bangalore-based fintech company, for instance, launched an app-based credit line with RBL bank to provide instant credit facility at a single swipe. It's not alone. CASHe, InstaPaisa and EarlySalary.com have also taken the instant loan market by storm. "On-the-go solutions (mobile apps) will definitely be convenient for customers, but what makes the difference is whether there would be any support provided for disbursements," says Manavjeet Singh, CEO, Rubique. Process: For MoneyTap, download the chatbot app on your phone. Once you key in the details on the automated chatbot, it connects to the banking system and a pre-approved credit limit - depending on your credit history with CIBIL - pops up on the screen. Once you get your know your customer, or KYC, registration done, the app will send you the final approval. After choosing the amount and the tenure, the money will get transferred to your account. Interests are charged only on the actual usage and not on the full amount credited. Repayment of EMIs can be made through the app. EarlySalary and CASHe allow registrations on their apps through Facebook, Google+ or LinkedIn accounts. Interest rate and tenure: Interest rates are high for apps, but they offer higher flexibility compared to banks. MoneyTap charges a one-time processing fee of Rs 499 and interest rates vary from 1.25-1.5 per cent per month. The loan amount could be anywhere between Rs 3,000 and Rs 5 lakh for a tenure of two to 36 months. CASHe charges a flat interest rate of 1.5 per cent for 15 days, or 3 per cent per month and 36.5 per cent annually. It provides loans of anywhere between Rs 5,000 and a maximum of 40 per cent of the customer's monthly salary or Rs 50,000, whichever is lower, for a tenure of 15 days. EarlySalary provides loans of Rs 10,000 to Rs 1 lakh for a period of seven to 30 days. MobiKwik, the mobile recharge app, also provides micro loans in the range of Rs 500 to Rs 5,000 for 14 to 30 days. Online portals, such as LoanTap, Faircent, India Lends and Rupeelend, provide loans to customers directly. Others, including Rubique, Lend Box, i-Lend and Bankbazaar, provide a list of potential lenders who may prove to be the best fit for a customer - the aim is to bridge the gap between borrowers and lenders and provide a single-shot view of the offers in the market. Process. To get a loan from an online loan aggregator, one needs to first key in the required information and upload all documents for KYC, including salary slip and three months' salary account statements. This is followed by a visit by a company executive for verifying your address, among others, before the loan is disbursed. Rubique has digitised the credit policies of financial institutions and has also integrated its system with that of its partner merchants to minimise the time spent on zeroing in on a financial institution. "Customers can opt for various modes of his or her choice for repayment of loans, including direct debit and online transfer. In case of failure of payments, the case is shared with third-party collection agencies for recovery," says Singh. But what if a person's credit history is not available? Rupeelend.com runs a real-time bank statement, Pan and e-KYC check, and verifies bureau reports and social network status, before deciding on a customer's goodwill and financial status. If the credit score satisfies their defined criteria for loan disbursals, the loan is approved. "For customers who are new to credit (Cibil score 0-1), or do not have credit cards, we become a viable and quick access funds options," says Siddharth Ravindran, CEO, Rupeelend.com. Similarly, Index Advisory provides test scoring for non-banking financial companies, banks and lending companies, to help these companies in their decision-making for people who do not have credit history. Psychometric tests are done to measure a customer's intention to pay, and are generally focused on his or her ability to pay back. Interest rate and tenure. Interest rates for online portals, such as Rubique and Bankbazzar, vary according to the product and from company to company. 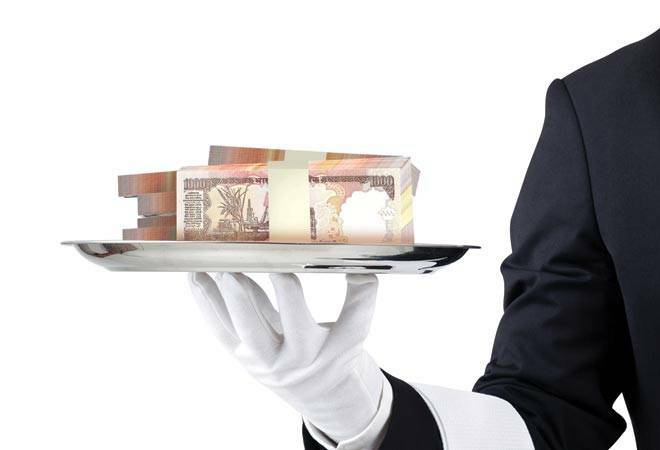 LoanTap, for example, offers 'advance salary loans' - a temporary advance against salary or pension - for 10- 20 days. They also offer 'special purpose loans' for tenures of three to 33 months. IndiaLends charges an interest rate of 11.99 per cent per annum, and takes at least two days to process the loan. Rupeelend provides short-term loan ranging from Rs10,000 to Rs1lakh for a new customer, and for repeat customers the loan amount can go up to Rs1.5 lakh, with an interest rate between 0.1 per cent and 1 per cent per day, and a maximum loan repayment tenure of 30 days. You can also take a loan on the credit card issued to you by your bank. 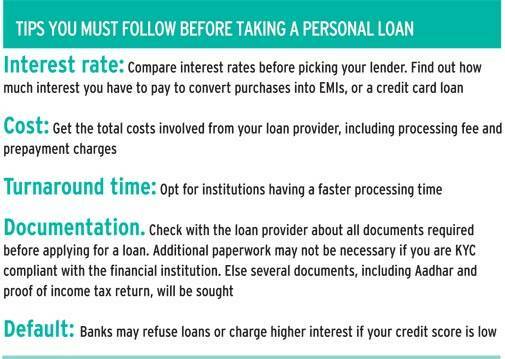 "Interest rates on a credit card loan are higher than the rates applicable on personal loans, ranging from 24 per cent to 48 per cent, depending on the bank or the customer's credit score. This is deterrent enough to opt for personal loan or credit card takeover products," says Satyam Kumar, CEO, LoanTap. Interest rates for cash withdrawal against your credit card are even higher. Loans on credit cards are mostly pre-approved loans, within or over one's credit limit. The EMI schemes offered by credit card providers make repayment easy in affordable installments. HDFC Bank credit card, for instance, provides pre-approved Insta Loan and Insta Jumbo Loan. For a loan availed against the Insta Loan scheme, the loan amount is blocked against the credit limit, while a loan under the Insta Jumbo Loan is over and above the credit limit. Some banks also provide loans against credit cards of other banks through balance transfers on EMI. These loans are offered to selected cardholders, as most credit card loans are unsecured and do not require any collateral. To be eligible for a loan on credit card one must have good credit history, and proved purchase and repayment track record. Process. Since most loans on credit cards are pre-approved, you need not submit any extra documentation. The loan is usually processed and disbursed quickly. Interest rate and tenure. The interest rates vary from one bank to the other. Standard Chartered offers loans of up to Rs 5 lakh on their credit cards with interest rates starting at 1.17 per cent per month, and has flexible tenures of up to 60 months. Selective customers of ICICI credit card can avail instant loans of up to Rs 5 lakh for up to 36 months under the "cash-in select" scheme. Bajaj Finserv offers EMI Cards - a pre-approved loan with an option to choose the tenure without any extra charge. It is true that loans are easily available these days, but you must not borrow unless it is abosolutely necessary, as it can ruin your financial health. "Credit inclusion and credit democratisation are huge challenges and opportunities in India. So as far as more lenders are coming in to solve these two problems it's good for the industry. However, the risks with credit is that too much of it can over leverage customers and can lead to defaults," says Parth Pande, co-founder and CEO, Finance Buddha.